Fried rice is always handy which does not require any side dish and it is full of nutrients as it has many veggies in it. It comes handy when ever i feel lack of time for cooking. It is whipped up in a jiffy with out much effort. Especially my little one also likes it as it is less spicy. Today i have come up with another combination for the fried rice. One day morning i planned to prepare fried rice for my hubby's lunch box and opened up the fridge and there was no carrots. I found a bunch of spinach over there and i made fried rice out of that and we liked that healthy version of fried rice. So i thought of sharing with you the recipe. Heat oil in a wide pan or wok and add the garlic and the white part of spring onion if you wish to add. Cook till the aroma arises. Now add the spinach and cook till it shrinks by constant stirring, when the moisture is almost dry add the sweetcorn and cook for a minute. Once the mixture is almost getting dry add the salt and cook for fifteen seconds. Add the cooked rice and sugar increase the flame to high and cook the rice by constant stirring or tossing for about 2 minutes. Finally sprinkle the green part of spring onion and switch off the gas. If you want this rice more spicy add a teaspoon of schezwan sauce with soya sauce. If you prefer scramble an egg with a pinch of salt and add with this. Note: Adding egg, spring onion, schezwan sauce is optional. 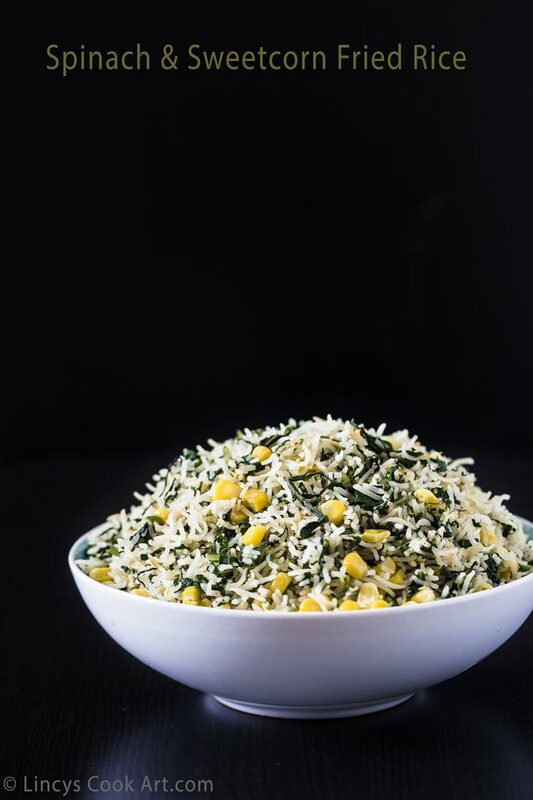 Do not cook and burn the spinach before you add the rice.